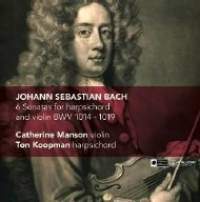 Another Koopman and Manson collaboration In these wonderful sonatas, the majority of movements are written as three-part counterpoint – the harpsichordist’s two hands plus the violin line. Here, the instruments are recorded quite closely, so that the polyphonic substance is focused with especial clarity: combined with brisk speeds and energetic, finely poised rhythmic delivery, the quicker movements acquire a splendidly exhilarating quality. The downside of such a sound picture is that where the harpsichord accompanies the violin, it can seem too insistent. However, this only seriously affects one movement in the set, the opening Adagio of the Third Sonata. Ton Koopman adds profuse ornamentation to his part. His sense of style is completely secure and he goes a long way towards giving his instrument an expressive character to match the violin. Even in the fast movements he shows that decoration can help onward impetus. Catherine Manson plays expressively; using very little vibrato, her tone is notably rich and, in cantabile movements such as those that open the Fourth and Fifth Sonatas, her sense of line leads to performances of true eloquence. My only criticism is that in the Allegro movements her long notes tend to be played with noticeable bulges, where either a gradual increase or a decline from the start of the note would make more sense. The set makes an interesting comparison with the rather more sober performances by Lucy van Dael and Bob van Asperen (Naxos). Van Dael concentrates more than Manson on the rhetorical shape of each phrase; Manson, with smoother phrasing, makes us more aware of the shape of the music’s paragraphs. Van Asperen’s plainer, sturdier style has strength and vigour but can seem less involving than Koopman’s brilliant, more imaginative presentation. And the more distant Naxos recording may produce a more rounded overall sound but lessens the impact of such pieces as the joyful Allegro at the start of the Sixth Sonata. Overall, Koopman and Manson have a distinct edge.